So I've blown this image up really big so that you can see the detail, like the little Rhinestone on the front of the bottle. Isn't it cute? This project was made almost entirely of Bubbles & Fizz DSP - you can choose this paper for FREE from a selection when you spend £45 on products during Sale-A-Bration (ends 31st March 2018). I fussy-cut the bottle from the paper, too, and it is a great focal point for the card. 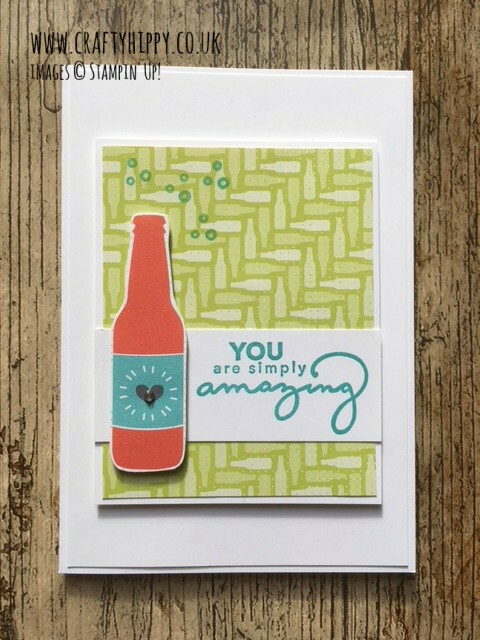 The stamp set Amazing You is also one of our Sale-A-Bration goodies that you can pick for free. In fact, you get a FREE gift for every £45 spent on Stampin' Up! products at the moment.